Ross Simpson: All right, here’s the promo for Part One of the Nuclear War Series. I’m Ross Simpson on a bus, heading into Cheyenne Mountain, outside of Colorado Springs, Colorado. This is the home of NORAD, the North American Aerospace Defense Command. This is also where my five part series on the nightmare of nuclear war begins this morning. Announcer: All right, here is the intro to Nuclear War Series, Part One. Forty years ago this week, the United States dropped the first in what the civilized world hopes will be the last atomic bombs. The bombing of Hiroshima and its sister city, Nagasaki, Japan, became a living nightmare for those who survived. This week, Mutual’s Ross Simpson take an in depth look at those events and how they changed the world in which we live. Simpson: If the nightmare of nuclear war ever becomes reality, it will begin in the missile-tracking center at NORAD, the North American Aerospace Defense Command, deep inside Cheyenne Mountain outside Colorado Springs, Colorado. Lt. Col. Mike Weniger: It begins here, because it’s here that we start that attack warning and the attack assessment process. It’s here that we use the combination of satellites and ground based radars to determine whether North America is under attack or not. Simpson: Although launch data is refined by eighty-seven computers at NORAD, Lieutenant Colonel Mike Weniger, Director of Missile Warning Operations, says man is never left out of the equation. Weniger: We validate all of that launch information, with a philosophy that we call “Man in the loop.” In other words, we never permit the computers to talk to the computers without the man’s intervention that says this is valid launch information or not. Simpson: Lieutenant Cath Goode was one of the men in the loop on Bravo Team the day I visited the Missile Tracking Center. Lt. Cath Goode: The way it looks here in the center, for somebody that’s never seen it before, it really looks chaotic. But if I could coin the phase, it’s an organized chaos. Simpson: When the bells go off, when the phones light up, do you ever wonder if this is the real thing? Goode: Well, when I was first qualified in this position and had my experience for the first time with events, that question crossed my mind more often. Simpson: But now when the phone rings, Lt. Goode says he’s no longer afraid. Goode: No, not really. If it were to really happen, I know that in my mind I would say to myself, “Yes, this is it.” But I would know what I would need to do as far as my job is concerned. I would know what to expect, and we would just sit the rest of it out. Simpson: What’s your background? Academy grad or two year—? Goode: No, actually, I came in through the ROTC program. I am a graduate of Brigham Young University, and my first assignment was at one of our sensor sites in North Dakota. Simpson: That telephone call is notification that highflying satellites have picked up a missile launch somewhere in the world. Lt. Goode and the rest of Bravo Team have only a few minutes to analyze incoming data and determine if North America is under attack. 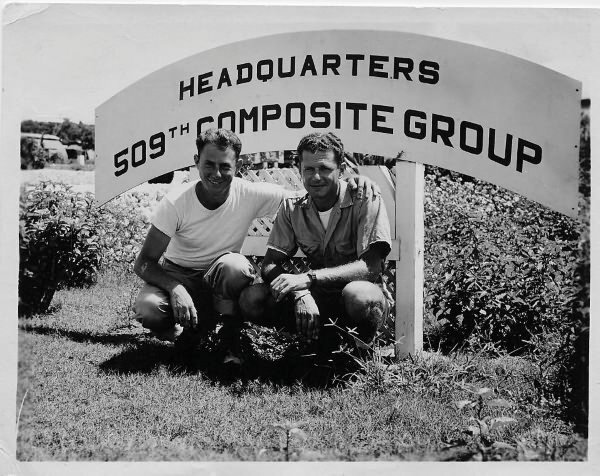 Simpson: I’m Ross Simpson, and coming up a conversation with Paul Tibbets, the pilot of the B-29 that dropped the world’s first atomic bomb on Hiroshima forty years ago today. Now here’s the intro to the Nuclear War Series, Part Two. Today is the 40th anniversary of the dropping of the atomic bomb on Hiroshima, Japan. Announcer: As part of a series this week on the nightmare of Nuclear War, Mutual’s Ross Simpson tracked down and interviewed several surviving members of the B-29 that flew that historic mission. Tibbets: I was aware that the bomb had exploded before I saw anything, felt anything or anything like that, by the reason of fact that I tasted it. Simpson: Paul Tibbets says a dental filling enabled him to taste the world’s first atomic bomb as it burst over Hiroshima. Tibbets was at the controls of the Enola Gay, a B-29 bomber he named for his mother. Although hate mail after the war labeled him as a killer of innocent civilians, Tibbets says he has no regrets about what it did. Tibbets: I had no love for the Japanese nation, people, soldiers, airman, or whatever. I had no love for them at all at that particular time, because of things that I had seen happen to friends of mine who had been caught in the Bataan Death March and some other things that took place over there. Admittedly, propaganda played a part too. But on the other hand, I was convinced in my mind that we had one job to do, and that was to defeat the Japanese, at any means at our disposal. Simpson: Bombardier Tom Ferebee and Navigator [Dutch] Van Kirk also have no regrets about the mission. Tom Ferebee: All I had to do was just get my crosshairs on the aiming point, and just sit there and let it ride. Theodore Van Kirk: I don’t think I had any realization about how big it was really going to be. You knew it was going to be significantly different from anything you saw before, but I guess I just didn’t realize how much bigger. Jacob Beser: We traded lives for peace. Simpson: Only one person aboard the Enola Gay actually saw the bomb explode. Tail Gunner Bob Caron wore a pair of welder’s goggles to protect his eyes. Bob Caron: Through the goggles, the explosion was just a tremendous buildup of light. Enough to make me blink real hard. Simpson: By the time Caron opened his eyes, the flash was gone, replaced by a shockwave and then that famous mushroom-shaped cloud. Caron: It was an awesome sight. I described the mushroom cloud as it grows as being white on the outside, and it was sort of a purplish black towards the interior, and it had a fiery red core. It just kept boiling up, just covering the whole city. Simpson: Of an estimated 320,000 soldiers and civilians in Hiroshima on August 6, 1945, more than one-third were killed in the twinkling of an eye. Several American prisoners of war also perished. Announcer: In his continuing series on the Nightmare of Nuclear War, Mutual’s Ross Simpson interviews a survivor of the atomic bombing of Hiroshima and one of the first Americans to walk through the devastated Japanese city. Konishi: I was sixteen years old when the atomic bomb fell. Simpson: Satoru Konishi was working at a shipyard about four kilometers from downtown Hiroshima when the world’s first atomic bomb exploded. Konishi says he saw the mushroom-shaped cloud rise from behind a small hill, but he didn’t realize what had happened until the following day when he and two schoolmates walked into the city. Konishi: I cannot say what I saw, what I did. Simpson: Konishi’s only memory is a man buried in the rubble, horribly burned and begging for water. Simpson: Mark Hatfield was a twenty-three year-old Lt. JG when he and some other Navy officers toured the ruins of Hiroshima in early September 1945. Hatfield said the experience was mindboggling. Mark Hatfield: We had no conception of the power of destruction wrapped up in that bomb, even when we saw the scene of utter and total devastation. Simpson: Hatfield, who later as a US Senator from Oregon would sponsor a nuclear freeze resolution, began to question whether there could be any virtue in war. Hatfield: It was amazing how that sense of hate for the enemy so quickly disappeared when we saw this field. It was a healing process for me, to turn my emotions around 180 degrees, where I felt an empathy for children and to share my sandwich, my lunch that I had brought with me, with them, because they were hungry. Children of enemies, children of people we were seeking to destroy only a few weeks before, so to speak. It was a reconciling, healing experience, as well as a shocking experience to see and have complete wonderment as to what kind of power we had unleashed on the world. Simpson: It’s been forty years since Doctor Edward Teller and his colleagues on the Manhattan Project tested and perfected the world’s first atomic bomb at Los Alamos, New Mexico. In an exclusive interview with Mutual News, Professor Teller, who later unlocked the secret to the more powerful hydrogen bomb, said he had no regrets about letting the genie out of the bottle. Edward Teller: Because genies are not made for bottles. Announcer: All right, here is a promo now for Part Four of the Nuclear War Series. I’m Ross Simpson and experts tell me by the end of the twenty-first century, any country that wants a nuclear weapon can have one. The question now before member states is how to stop the spread of nuclear weapons before everybody on the block has one. That story, coming up. Now here’s the intro to Part Four of the Nuclear War Series. Since a mushroom cloud rose over Hiroshima, Japan forty years ago, at least seven nations have developed the bomb. The CIA estimates by the end of this century, fifty countries will be capable of building nuclear weapons. In his continuing series on the Nightmare of Nuclear War, Mutual’s Ross Simpson talks to an expert who believes the question of how many nations have the bomb is irrelevant. Simpson: It’s estimated there are now more than fifty thousand nuclear warheads stored or deployed around the world, half of them belonging to the US. Dr. Charles Evenger at Georgetown University’s Center for Strategic and International Studies likes to think the superpowers will refrain from using nuclear weapons. Dr. Charles Evenger: What appears more likely is that one of the smaller nations of the world, feeling that security is overwhelmingly threatened, will acquire a bomb. A conventional conflict with a longstanding hostile neighbor may then break out. One country feels that it is going to be overwhelmed with conventional weapons and decide to use a nuclear bomb for its own survival. In such a scenario, the danger would of course be that different ones, these states across the world, are either client states or friendly states to the United States or to the Soviet Union. Depending on which adversary was getting clobbered by its immediate neighbor, it might be the case that the superpowers would be sucked in as allies of these countries, and then we could escalate the conflict to involving nearly the entire world. Simpson: When you talk to people about nuclear war, the term “nightmare” surfaces in almost every conversation. How real is the nightmare? Evenger: The nightmare, I think, is very real. For example, these numbers are of course all estimates, because no one quite knows what would happen in a full nuclear exchange. But it is generally estimated that in a full nuclear exchange between the United States and the Soviet Union, something like 40,000,000 Americans might die in the first twenty-four hours of the actual bomb attacks. Another 50,000,000 or 60,000,000 Americans might die in a period of days or weeks from radiation. So that we would have say half the population, perhaps a little more, survive the initial exchange and the direct lethal dosages of radiation. But how many people would die months or several years after from health effects from the radiation. Possible changes in the climate, if you believe the soothsayers of doom who believe that the sun’s rays might be cut off from the earth and the ash that would be left in a nuclear explosion. It would be such a cataclysm, that I think the reason we call it a nightmare is simply that it’s on a scale of conflict that the world has never seen, and simply can’t envisage until it were to occur. Simpson: Eighty-five countries meet in Geneva next month to review progress under the 1968 UN-sponsored nuclear non-proliferation treaty. Third world countries are expected to criticize the superpowers for dragging their feet on nuclear disarmament, a promise embodied in that treaty. Announcer: Now the intro to the final part on the Nuclear War Series, Part Five. It is somehow appropriate that Ross Simpson’s five-part series on the Nightmare of Nuclear War ends on the 40th anniversary of the atomic bombing of Nagasaki. That was the last time a nuclear weapon was used in anger. Simpson: August 9, 1945 is a date burned into the body of Senji Yamaguchi. Yamaguchi was digging air raid trenches about a mile from where the bomb burst over Nagasaki. Although his body was horribly disfigured by the intense heat and radiation, Senji, speaking through a State Department translator, said he doesn’t hate the American B-29 bomber crew who caused him so much physical and emotional pain. Senji Yamaguchi: I don’t have any hatred toward them because the government ordered them to drop the bomb. Simpson: It’s been forty years since the last nuclear weapon was used, but history tells us two Generals, [Douglas] MacArthur and [William] Westmoreland, wanted to use them in Korea and Vietnam respectively. Permission was denied by Presidents Harry Truman and Lyndon Johnson. This is not to say that nuclear weapons will never be used again, but forty years of peace is comforting to Roger Mullender, President of the prestigious Roosevelt Center, a think tank in the nation’s capital. Roger Mullender: Things are real stable here on planet earth. There’s plus or minus, you know, 170 countries. Clearly, in time, certainly by the year 2100, you know the great majority of them, probably by 2040 or 2050, are going to be able to get the bomb if they want to. In that world, can you be assured that they will not be used again in anger? What kind of pieces would have to be there on the board, in order that you could look back at Nagasaki and say, “That was the last time,” and you taught the kids that that was the last time? Everybody believed there was a taboo against that ever happening again. That somehow, Nagasaki embodied that, that that was the very last time. Simpson: The US has always maintained that offense is the best defense to enemy attack. That’s why a Minuteman III Missile is buried in a silo near Kirk Swearinger’s ranch outside Kimball, Nebraska. Kirk Swearinger: I guess it probably really doesn’t matter but you know, you’re close and you sure in heck would hate to see things all go up. But that’s life. Simpson: The missile, which is buried just behind this fence, is MIRVed. In other words, it has three nuclear warheads. It contains more destructive power than both of the bombs we dropped on Japan during World War II. The Air Force says this particular missile is one of one thousand Minutemans stationed in Nebraska and five neighboring states. Looking around, this is America’s heartland, miles and miles of waving wheat. But it could become her wasteland if these weapons are ever fired in a full nuclear exchange between the US and the Soviet Union. I’m Ross Simpson, outside of Kimball Nebraska.